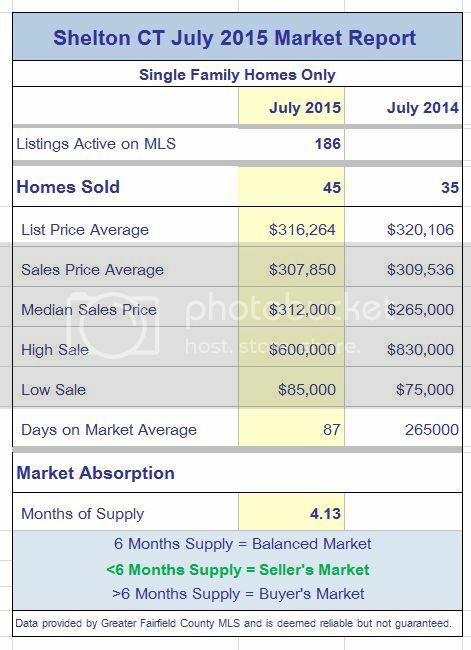 Listing and closed sales averages both declined negligibly at 1% compared to 2014. Inventory remained the same but the higher sales rate helped keep the absorption rate low at 4.13 months. Translation: it would take 4.13 months to sell off the present inventory of 186 homes. This is statistically a SELLERS market. Going forward, there are 34 homes under deposit and 35 homes pending. Thinking of Buying or Selling in Shelton CT? SEARCH homes here. Where was the sweet spot for sales in July? It remained in the $300K - $400K range in Shelton, which is historically the most popular range. 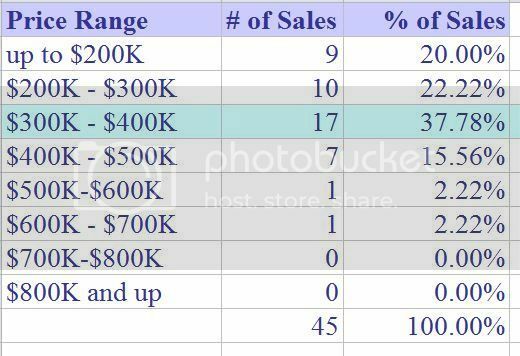 80% of sales were below the $400K mark. 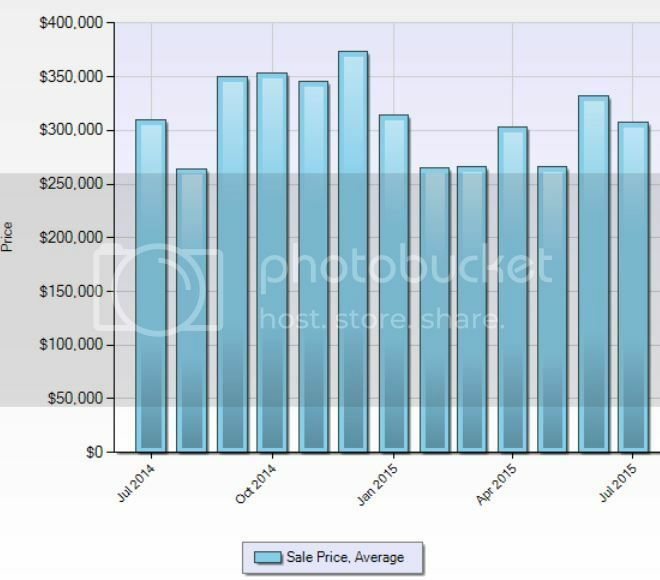 July 2015 sales were down just slightly from that annual high point in June! Still a nice showing for the month. The average sales prices throughout the last year provides buyers and sellers with an even better understanding of Shelton's present and past market. July averages were off a bit. The scales were bottom heavy this month. The absorption TREND, which shows the number of months it would take to sell the entire inventory at the same pace, came in at 4.65 months for the last three months, right in a sellers market statistically. This was down two months from last month. More inventory needed!! This rate is for ALL houses. If you are selling your home, your agent should calculate the absorption rate for your price point to get a more accurate analysis. Some price points favor sellers; others favor buyers. Thinking of selling? 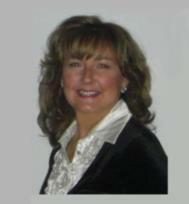 Get a complimentary free market analysis for your Shelton home. The success in selling your house in Shelton or any other community is dependent upon accurate pricing, effective preparation, calculating the absorption rate for your particular price point, and having a strong online marketing presence. Contact me for advice on how to list your home effectively in today's market. Get an exceptional marketing plan for your money. 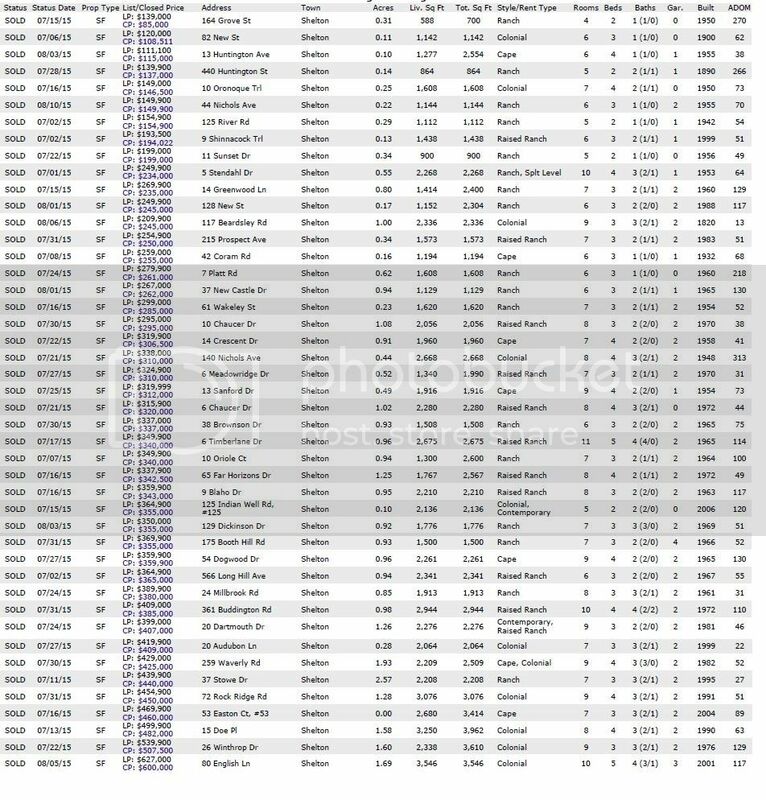 Date Source: Greater Fairfield County Multiple Listing Service -- August 28, 2015. No representation or warranty is made to the accuracy of this information. Who Took The Pictures For This Listing? Does Your Listing Stand Out Among the Crowd?